Impulse Turbine or Reaction Turbine can be used in power plant to produce the electricity. Both turbines are different in design so you have to select the right one. The selection of turbine depends on power plant size and other parameters. The selection of proper turbine is a very critical issue and an expert people in engineering can take the right decision only. 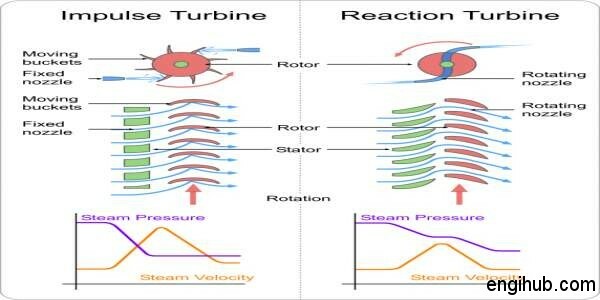 Hence I will like to share some differences in between impulse turbine and reaction turbine with you. The turbine is a prime mover in which a rotary motion is obtained by centrifugal force brought into action by changing the direction of the jet of a fluid escaping from a nozzle at high velocity. C) A combination of Impulse and Reaction Turbine. In an impulse design of steam turbine, there is an attempt to attain no expansion of steam within the moving blades. And as such its pressure remains constant while passing over the blades. The expansion of steam, however, takes place in a set of stationary nozzles. Which lower its pressure but impart a high velocity to it. The velocity attained in a properly designed nozzle depends upon the pressure drop through it. Impulse turbine design may be classified as the single stage or multi-pressure stage. And also a multi-velocity stage, and the combination of multi-pressure and velocity stage. The term pressure stage refers to a unit of nozzles combined with moving blades. In which the energy of the steam resulting from each pressure drop is utilized. The velocity stage refers to the number of moving blades. In which the energy of the steam in each pressure drop is absorbed. 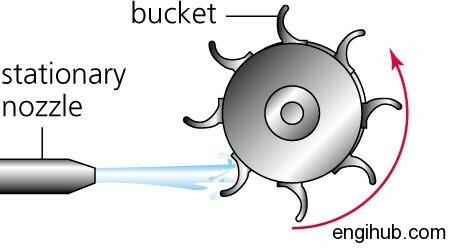 While in the case of reaction turbine, the steam expands as it flows over the blades which, therefore act as nozzles. In fact, it is this drop in pressure that gives a reaction and hence motion to the rotor. A pure reaction turbine comprises two or more radial tubes. These tubes rotating and communicating with another pipe through which steam is supplied to a nozzle. Which is screwed into the ends of the radial pipes and arranged with their axis in the tangential direction.